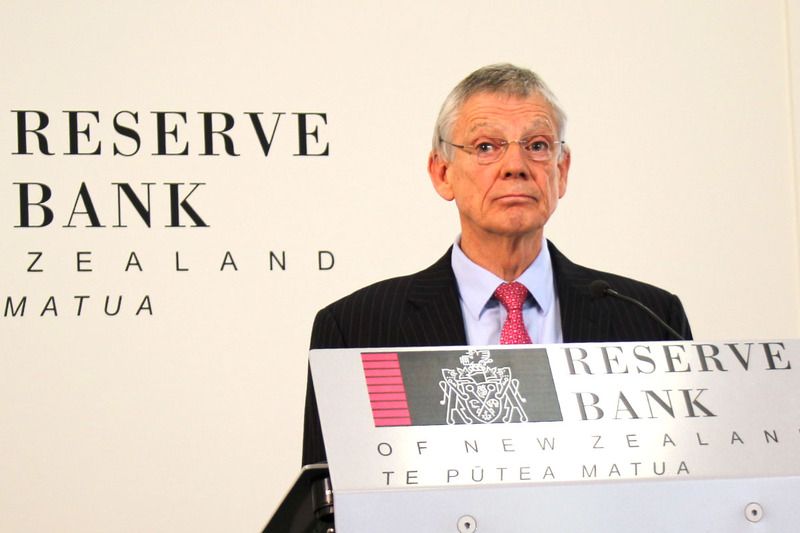 Reserve Bank Governor Graeme Wheeler speaking at the June 9, 2016 Monetary Policy Statement news conference. Photo by Lynn Grieveson for Hive News. The Reserve Bank has repeated its warning that the financial system continued to face housing and dairy debt risks, although it remained highly profitable, sound and strong. In releasing the Reserve Bank's half-yearly Financial Stability Report, Governor Graeme Wheeler said housing imbalances remained in the economy, even though house price inflation in Auckland had softened in recent months. Wheeler confirmed he had asked Finance Minister Bill English to include a tool to limit Debt To Income multiples in the bank's Macro-Prudential tool kit, but that the bank would not use the tool "at this time." "House price to income ratios in the (Auckland) region remain among the highest in the world and prices are continuing to rise rapidly in the rest of the country. There is a significant risk of further upward pressure on house prices so long as the imbalance between housing demand and supply remains," Wheeler said. “The Reserve Bank has asked the Minister of Finance to agree to add a Debt to Income (DTI) tool to the Memorandum of Understanding on macro-prudential policy. While the Bank is not proposing use of such a tool at this time, financial stability risks can build up quickly and restrictions on high-DTI lending could be warranted if housing market imbalances were to deteriorate further,” Wheeler said. Elsewhere, Deputy Governor Grant Spencer said the Reserve Bank's new 40% deposit requirement for rental property investors from October 1 had increased the resilience of bank balance sheets to a housing market downturn. “However, the share of bank mortgage lending to customers with high DTI ratios has been increasing and this could increase the rate of loan defaults during a housing downturn," Spencer said. “The banking system has strong capital and funding buffers and profitability remains high. Despite being relatively concentrated, New Zealand’s banking system also appears to be operating efficiently from an international perspective based on metrics such as the cost-to-income ratio and the spread between lending and deposit rates," he said. “However the banking system’s reliance on offshore wholesale funding is beginning to increase due to a widening gap between credit and deposit growth. Banks could become more susceptible to increased funding costs and reduced access to funding in the event of heightened financial market volatility." Spencer noted the Insurance sector was well positioned to cope with claims from the 7.8 earthquake in Kaikoura on November 14. Later in the news conference, Wheeler and Spencer said any use of the DTI would follow the British example of having a speed limit and allowing a certain percentage of lending above a certain multiple. He said the bank would look to use the DTI multiple if house price inflation picked up because of a rise in mortgage lending with high DTI multiples. Asked what would change the Reserve Bank's mind about currently not using the DTI, Wheeler said: "I think what we'd need to see is that there's a resurgence in house price inflation, that it was picking up in Auckland and also picking up further nationally. And we'd want to be clear that it's credit related, with commitments expanding and continued increases in DTI." Wheeler declined to say which DTI level the Reserve Bank would target, but noted the Bank of England used 4.5. "If you look in the UK, for example, I think the ratio they have is 4.5 with a requirement that no more than 15% of lending take place above that DTI ratio. Now I am not giving any indication of our thinking in terms of a particular ratio, but we would probably be that sort of concept," he said. They say: "An important feature of a DTI policy is that the borrowing capacity of constrained borrowers grows in line with their incomes. In contrast, sharp rises in house prices unlock borrowing capacity for existing property owners under an LVR policy, especially for borrowers with a large portfolio of property. " They have previously said (2015) that by contrast to high income borrowers and investors, the share of high TDTI lending is much lower for first home buyers.."
Expect the DTI ratio to be about 5.5 to 6, which will likely affect very high income buyers and "investors", but will be irrelevant for FHBs (at least the prudent ones). RBNZ seems to be in the right analytical place, but as for LVR limits they are too slow to implement. Truth more likely the specuvestor sector could not sustain implementation of DTI. Assume an average Auckland house, value $1m, renting for $700 p/w, a highish DTI of 5x, and no vacancy, the maximum debt to be carried would be just under $200k. That would be a very conservative example. Show me a specuvestor carrying 80% equity... yeah right. 2017 Election will be a golden opportunity for the under 30s to back a strong DTI policy if they can get off their ipads for a minute and actually vote for something thats really effecting them (home ownership) as lets face it, the options for the under 30s to run away to Aussie or the UK are a shadow of what they once were. The big four banks - ANZ, ASB, Westpac and BNZ - had been borrowing roughly $80 billion a year in offshore funds but that had jumped to around $90b in the last year. "That's quite a large increase in one year and you couldn't expect us to continue to increase like that," Hisco said. Why can't our local banks just revert to this tried and true method of deposit creation? Unless of course, the Australian parent banks are prohibited from making good on funding regulatory capital requirements such lending growth demands and the off-balance sheet reality of derivative dependent wholesale foreign funding is restrained by credit ratings and cost considerations? This is good news as far as I am concerned. No its not - you just don't know it. As things are looking, it is probably wiser to wait and see what direction the market takes. What 'market ' would that be? Auckland. Prices already down 100k.. 15% or so based on what sort of discount is required to get a sale in auckland right now. Auckland property prices left the 'market' behind along time ago. Don't forget that insurance companies are now questioning the risks associated with rentals and drug contamination, which may have a bigger impact for investors who might find insurance premiums excessive if available at all. So the effects that the RBNZ are claiming may actually be coming from other causes. Its the pausing of the family reunification or parent category for immigration which is causing the latest burp in house prices. The parents of the new “jonny grants” arnt able to come – so why stump up the cash to buy the house for son and daughters in god zone. Question. When the owner of multiple properties has a mortgage up for review/renewal is that mortgage subject to the 40% rule? Just another soft option then. Why does Wheeler still have the job when he is prepared to pussyfoot around on nearly every decision. They won't use it in 2017 either, due to the Elections. Good point serioussaver. If Kids education cant backdoor residency for mum and dad, why punt for a big house when an apartment will cover little johnnys/suzies free education in NZ? Pf note he has requested DTI for the toolkit. Will be very interesting to see if that is approved. Thought it was his brother that was the farmer. is it just me, or did Wheeler look very anxious in this video clip? The ponzi scheme has been called! Watch the fireworks - the 10-year T Bill is on fire & only just begun. DTI is not necessary at this point. We're currently in wait/see as to whether market has entered crash proper. If things don't pick up significantly early next year, the quiet and orderly worry we're currently witnessing is going to turn to public panic very quickly. If Wheeler looks worried, it's because the housing market looks like it might tip off the fiscal cliff, leaving him to have to redo stress tests with much less reassuring results. In related news, it appears that commercial property on Auckland's North Shore is booming. In other words, speculators have the spooks on residential and are ploughing all their phantom equity into commercial. Which never ever crashed in Auckland before, right guys? Right?! Oh dear. At least NZ is good for a laugh. Tsk, tsk, silly old RBNZ, they are just so last year. If they were up to speed they would be floating a real proposal with actual teeth, instead of the limp drivel they so seriously intone. This shocking Minnesota Fed proposal is daring, courageous and exciting (ie, probably doomed, but you never know). It proposes that banks actually have real reserves of 20 to 35% of their loan book. Not the puny, insignificant 2% the Aussie banks get away with here, with their 25% weighting of 8% smoke and mirrors. The bigger the bank, the bigger the systemic risk, therefore the higher the required reserve ratio. The objective of the Minnesota Fed proposal is to make it uneconomical for banks to be too big. Where is the equivalent New Zealand proposal from the RBNZ? Asleep at the wheel presumably. The banks with their current funding issues have effectively already bought in DTI ratio's. Was John Key not aware when said earlier that have no problem with DTI and is upto RBNZ to decide . So what happens now. No one to ask them serious question. "He said the bank would look to use the DTI multiple if house price inflation picked up because of a rise in mortgage lending with high DTI multiples." looks like vested interests oppose DTI, so would cause a downturn. what surprises me the most is the RB pushing for it as it contradicts there stance on bank risk hence the OBR.